Chris Hemsworth is an Australian actor, best known by the public for his appearance on Thor in the Marvel film series. His other film roles include Rush, Red Dawn, In the Heart of the Sea, The Cabin in the Woods and Vacation. Chris was born in Melbourne, Australia, to Leonie and Craig Hemsworth. He belongs to Dutch, Irish, English, Scottish, and German descent. His brothers are actors Liam Hemsworth and Luke Hemsworth. He has been married to Spanish actress Elsa Pataky since 2010. They have a daughter, India Rose and twin sons, Tristan and Sasha. *He attended and graduated from Heathmont College in Heathmont, Victoria. *He has Dutch, Irish, English, Scottish, and German ancestry. 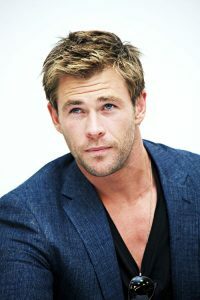 *He gained 20 pounds of muscle for the title role in Thor (2011). *He was chosen as People magazine’s Sexiest Man Alive in 2014. *Glamour magazine named him one of the “50 Sexiest Men” in the World in 2013. *He danced the Samba in the Australian version of Dancing With the Stars. *He was in a relationship with Australian actress Isabel Lucas from 2005 to 2006. *Follow Chris on Twitter, Facebook and Instagram.